February 27, 2017 February 27, 2017 Your Life As Art Essentials - Pamela McLellan-ZmijaLeave a Comment on Is It Time For A Change? Have you experienced illness in your family or are just tired of feeling unmotivated, blah and tired all the time? We all lead such busy lives, many always on the go, not much downtime. If there is one thing I would ask of you from my heart is to take a step back, just for a moment, and ask yourself is this where I want to be? I was once very threatened by my health with many bad experiences. I am that mom who went through Infertility and then was blessed with two beautiful babies just under 18 months apart. Who emotionally struggled with my health challenges compounded by two beautiful babies. A working mom who with a 12 month old and 2 1/2 year old was heading back to work who continues to work and build our dreams together with her husband and family. A woman who has had her shed her fair share of tears and also been so filled with love Ive felt like Im going to burst. Life has its challenges, no one ever said it was going to be easy. Being a woman, being employed full time, being married, being a parent. I am that woman who understands! The absolute best investment I have ever made has been in myself! An investment Ive made in both money and time. Using these all natural health products in place of many various pharmaceuticals and chemically filled products. Physically and emotionally my health and wellness is now thriving! My “bad” days are much less and I am healthier than I’ve been in the past almost 20 years! I made a promise to myself and I am achieving it. It’s not easy, however after getting through the challenging first steps, it really is SO much easier. It is an investment, I’ve always been cautious with my money. But it’s truly pennies per drop or dose! I was worried what people may think, however what they think has zero impact on how amazing I now feel. This investment in myself, has been like a domino effect on my family with also bettering their lives. This is an investment which is paying me back more than what money ever could. So for 2017, whether you choose to take this step with me, I ask you to reflect on this. Difficult roads often lead to beautiful destinations. The first step towards true greatness is being honest. When health is absent, wisdom cannot reveal itself, art cannot manifest, strength cannot fight, wealth becomes useless and intelligence cannot be applied. Take a moment and reflect, emotionally, physically and spiritually. For me 1 of those changes this year is getting up without an alarm. I have always been a night person, I’ve also always struggled with sleep. After our January personal development business training I made a commitment to myself… to get up without an alarm! Sounds silly right, kind of, but to me it was significant! The way it’s impacted my life has been phenomenal. The domino effect. Our mornings have a much gentler start, I feel more together and prepared. And on those odd mornings where I do sleep until my alarm… its because my body truly needed it – and that’s ok! The biggest factor is I feel good! Prior to declaring that I was going to get up without an alarm I began a cleanse with other team members. Although Ive been taking our plant based supplements for 2 years there were more days than not that I would only take half the dose or some days (weekends) forget them altogether. I was feeling good, however I was missing out on how much better I could be feeling. So this January when the cleanse started I committed to really and truly DOING this! Of course I am human and there were a couple days at the beginning I did miss a couple afternoon doses – however the more you do it, you begin to form a natural habit! In sticking with it Ive been able to significantly propel my own life forward with my health and overall wellness with fabulous results! 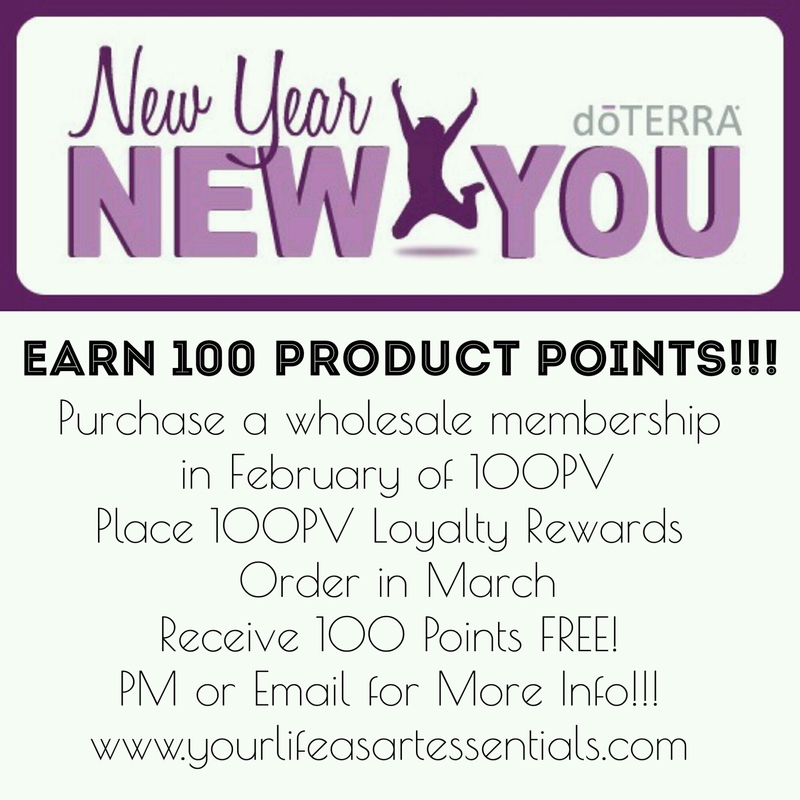 For those of you who are ready… don’t miss out on this New Year New You promotion from doTERRA! An opportunity to get started and be rewarded with points to use towards free product. This is ONLY UNTIL FEBRUARY 28th! So if you are ready… lets connect!